It's not news that curling attendance is suffering of late. It's also not earth-shattering that one of the major causes of that is the excellent television coverage. 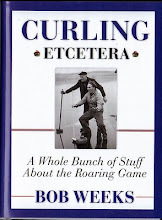 Curling fans, who are generally older, like to sit at home and watch rather than go to the rink, the thinking goes. But Don Marks, writing on CBC.ca, argues that one of the major reasons people aren't going to watch curling live in the numbers as they used to is that it's a lousy sport to watch in an arena. The problem is that you can’t see most of what is going on from most of the seats in a large arena. For example, when you are sitting at one end of a sheet of ice, you cannot see exactly what happens when rocks arrive at the house at the other end. Unless you are sitting in the nose bleed seats far away from the live action, it is impossible to catch the angles and nuances of the shots, and this is especially frustrating in clutch situations. Curling is a game of inches that demands an overhead camera to determine exactly what is going on. What live curling really needs are overhead seats. It's true. Depending on where you're sitting in the rink, it can be hard to figure out what's going on. I remember during the Vancouver Olympics vacating my media seat to sit for a few ends with a friend who was in the VIP section. It was on the side, near one end. You couldn't see have the houses and even those that you could see were limited in scope, i.e. who was shot. Much of that was alleviated by the screen on the clock apparatus that sat in clear view to everyone. It showed the TSN feed without sound. But it only covered one game so if you were trying to watch a game that wasn't being featured, it was tough. That said, I think part of the experience of being in the arena is to hear the sounds of the crowd, the yells, the rocks crashing. I also think in most cases you can see at the very least some of what's going on and so you can get a really good sense of the talent of the players. Two years ago I went to the old Maple Leaf Gardens for the Players Championship and stood up on the concourse and could see much of what was going on. Would it have been better on TV? For sure, but there was a really cool part about being there. And that's what I think Marks is missing here. Marks goes on to say that he believes if something doesn't change, curling will face a slow decline in attendance that will devastate the sport as a live event. Ratings for TV broadcasts of curling remain high and the CCA is already talking about moving major competitions into smaller houses (6-9,000 seats) to maintain the atmosphere of a “packed house”. But how long are sponsors going to lay out big cash for games where the crowd noise sounds like a community club swim meet? This is not the way to build the sport. It is ironic that people keep predicting that elite sports like football and hockey will price their tickets outside the market for the average fan so that one day the seats will only be filled by corporate suits or none at all. And it turns out that the most grassroots sport of them all is the one that is playing before empty houses. I'm not so sure that smaller venues aren't a positive. I mean, if you can take the Brier back to places such as St. John's, where it will likely be a hit and probably sell out, it's a good thing. As long as the sponsor is happy and you don't lose your shirt. So curling fans, do you enjoy going to the game more than watching it on TV or perhaps a little bit of both? 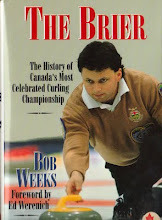 Over at In The House Curling, one of my favourite blogs, Mike Fournier, allowed 2006 Brier champion Jean-Michel Menard to post a guest blog and it's quite an eye-opener. Menard doesn't tackle the easy topic of relegation, but pulls back the curtain on the constant cuts to the Brier, from a player's standpoint. Essentially the article says that as far as players go, there has been a slow erosion of services. Some of the things Menard discusses are the lack of dedicated drivers, the disappearance of the players' lounge, fewer hotel rooms and even food in between games. The one that sticks out for me is the end of a team driver. There's a great history of teams having their own driver. For volunteers, it was one of the great jobs to get. In one of the most famous partnerships, Sam Richardson served as the team driver for Jack MacDuff's Newfoundland team that won the 1976 Brier. Richardson started the week as the driver and ended up as the team coach! From the CCA side, I suspect this is something that had to be done to preserve the bottom line. The Brier is no longer the cash-cow it once was. Cutting costs is just something that's unfortunately inevitable. When crowds aren't showing up, the money has to come from somewhere. It may seem cheap and it may come at the expense of the stars of the show, but I'm not sure what else you can do? However, a few of these cuts make the CCA look bad. Food in the players dressing rooms between games seems like something that could be arranged pretty easily. If you have back-to-back draws, the time between games can be tight, especially if you happen to be a player or team that is in demand by the media. You finish your game and spend possibly 30 to 40 minutes with the press and then have to hustle to get something to eat. And if the officials are getting something in their room, I can't see why the players shouldn't get something too. Have to give a shout-out to the old-timers who are still very much young at heart who will be competing in the Diversicare Grand Masters Ontario championship at Thornhill Country Club. The championship starts on Thursday. Now this event is for players 70 and over but if you watched these folks toss rocks and sweep, you'd never believe they were of that age. They're limber, spry and fit. Some of these guys are curling 70, 80 or even more games in a season! If you're in the area, drop by and check on the curling. You can go here to get the draw and a list of the teams and many of the names will be familiar -- these guys have made their mark in just about every division along the way and will continue to be doing it this week. So hats off to the Diversicare Grand Masters. Good luck and good curling. Mark Dacey's call out of the Nova Scotia Curling Association had some results it seems. According to Monty Mosher of the Halifax Chronicle Herald, Dacey and a number of other competitive curlers from the province met with officials from the Nova Scotia Curling Association behind closed doors on Saturday to deal with issues the curlers feel are holding them back against other players across the country. Dacey said every player in the province will say that playing conditions for provincial competitions must be improved and brought in line with the type of conditions found at the Brier or the Scotties Tournament of Hearts. He compared the current situation to having an Olympic sprinter do his training on a dirt road. “They would train in the conditions that replicate the Olympics ... because that’s the best chance for success. We aren’t given that opportunity. Of course under the new relegation system at the Brier, Nova Scotia missed the main competition for the first time in the event's history. Jamie Murphy, who has won the Nova Scotia title two of the last four years, served on the ice committee and said the conditions have simply been inadequate. Murphy, who came to Nova Scotia from New Brunswick, said he served on Nova Scotia committee to set ice conditions for provincial play and those conditions haven’t been met in the past four years. “They haven’t even been close,” he said. “The ice conditions in all of the qualifiers and all of the Tankards have been inadequate. Brad Gushue is standing by his comments about the Brier's bronze-medal game, telling the St. John's Telegram that the game simply needs to go away. Gushue, who lost the game to Saskatchewan's Steve Laycock, said he has never wavered in his opinion. “I said it before. I said it when I won the bronze medal at the Brier and when I lost the bronze-medal game,” said Gushue, “When I said it this time, I was being consistent. “I meant it. I stick by it. I’m not ashamed of what I said, because it is how I feel and how I’ve felt all along. He also went on VOCM radio and re-iterated his comments, telling listeners that while he was trying in the game, he wasn't emotionally invested. You can listen below. Later in the interview, Gushue details just how silly the bronze medal format is using the past Scotties Tournament of Hearts as an example. Gushue first made the comments in the Calgary Herald shortly after the contest ended. It was met by a response from Curling Canada's Al Cameron, who said the game is not held to make money but to provide consistency. “As an organization, nobody’s making money off this and putting money in their pockets,’’ clarified CC Director of Communication and Media Relations Al Cameron. “The money made from all of the games goes right back into the development of the game, from the grassroots on to high-performance. 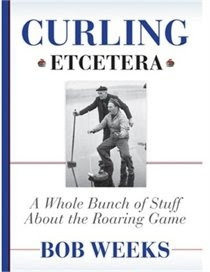 “It’s all good for the game of curling. “A bronze-medal game is used at the Olympics, it’s used at the World Championships. Teams have to get the mindset that if they’re playing for Canada with a medal on the line, they need to be prepared to play like it means something. While the World Championships used the same page-playoff format as the Brier, the Olympics do not. They proceed with two semi-finals and a final, making the idea of a bronze medal game logical. The page system, of course, has just one semi-final which most would think means the loser of that semi would finish third. Still, the game was a winner for ratings on television with 621,000 people tuning in. OK, so while Brad Gushue and I clearly don't like the bronze-medal game, a lot of other curling fans do. The match that the Newfoundland and Labrador skip called the "dumbest game in curling" drew a whopping 621,000 viewers, which is a huge number for an inconsequential game. It lends credence to why the CCA Curling Canada wants to keep it around. And the final? Well how about 1.25 million viewers? That's massive and will be among the top audiences TSN gets for the entire year. Overall, the TV number for the Tim Hortons Brier were up over last year, not a big surprise considering 2014 was an Oympic year and the burnout factor was likely in place. The overall average for the week was 587,000 with 7.5 million Canadians watching at least part of the Brier. That's a 29 per cent increase from last year. Impressive in a country of 35 million. · The Page Playoff (3 vs. 4) featuring Pat Simmons vs. Steve Laycock attracted an average audience of 710,000 viewers.